Nike's 4% running shoes debuted a few years back as part of the brand's 'Breaking 2' project. That's 2 as in 2 hours, to run a marathon. Realistically, no matter how good they make their shoes, a sub-2-hour marathon is really not going to happen any time soon, but the advancements made for Nike's elite stable of athletes can also benefit you as you hobble home in 15,007th, but in a faster time than your last effort. The Vapourfly 4% Flyknit really is one of the best running shoes you can buy. The original 4% was "as close to a complete reimagining of the running shoe as you’re going to get," according to our resident Iron Man super-runner Kieran Alger (just back from the Marathon des Sables, more or less intact). Both Eliud Kipchoge and Mo Farah wear them for marathon running, and world record holder Eliud calls the system "really perfect," which is quite the compliment. 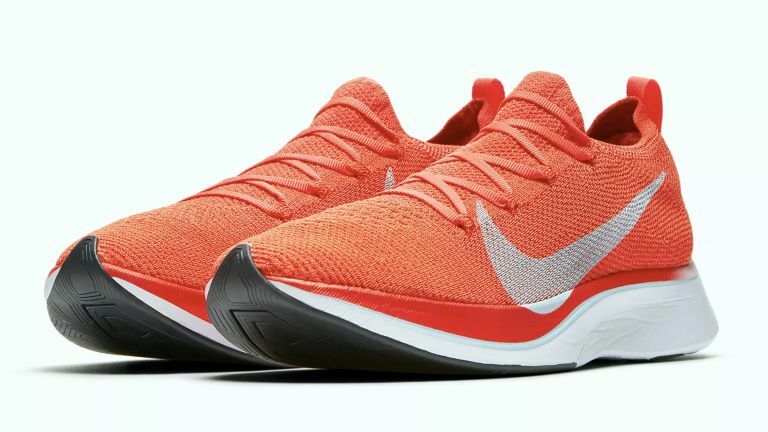 Most of Nike's most high-end innovations are packed into the 4%'s sub-195g chassis, with Nike ZoomX ultralight foam cushioning delivering 'our greatest energy return yet.' A carbon-fibre plate springs up under your heel as you stride forwards, adding further impetus. The earlier, Nike Zoom Vaporfly 4% has been worn by winners of the New York, Boston and Chicago Marathons. Nike Vapourfly 4% Flyknit, like all 4% shoes, is only made in extremely limited quantities, and they sell out FAST. So if you have feet that are of average to large size, you're probably already out of luck. However if you are extremely small, or wear a size 8, you can still get stuck in.